Here the next steps to our expense/budget sheet. Go to the first page if you haven't read it. We do not need to write the formula on every line.... great!!! 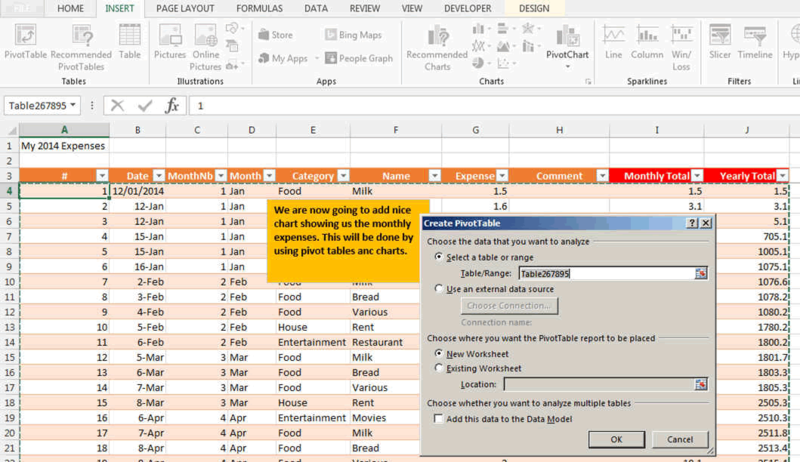 By double click on the corner, the formula will be copied automatically towards the bottom. 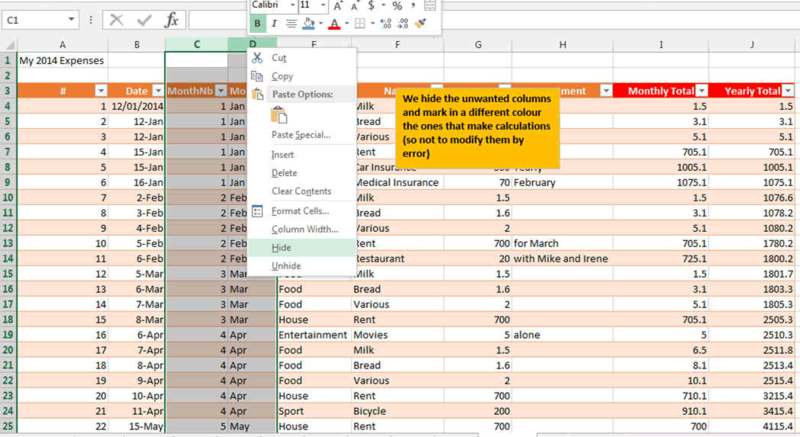 Now that we have entered the formulas, we can hide the unwanted columns, right click on the columns and press Hide. We have also changed the color of the header for monthly and yearly. So that we can see them better. 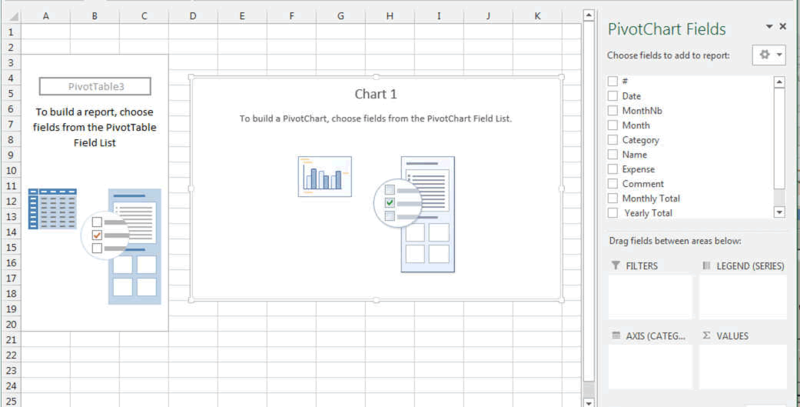 The create pivot table window opens and asks you to confirm the table name (or range of the table sometimes). Press OK. This new sheet opens. It will allow you to create a graph just by dragging the fields. 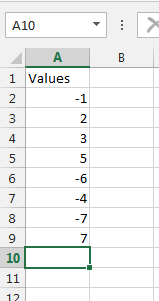 By dragging the Month and Category into the AXIS area and then the Expenses into the VALUE area you get already a table and a graph. But... something is wrong with the graph. It show you the COUNT and you do not want the count but the SUM of your expenses. So by clicking on the small arrow to the right of the COUNT OF EXPENSES, you will get the following window. 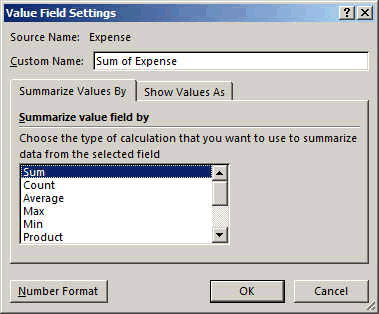 ANd by selecting the last one "VALUE FIELD SETTINGS" you get to change the COUNT to SUM. The graph and table are correct. 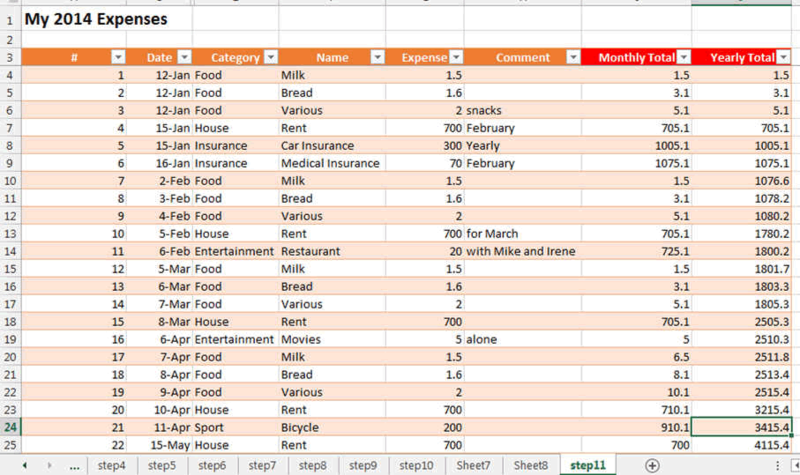 Showing you per category and per month your expenses. 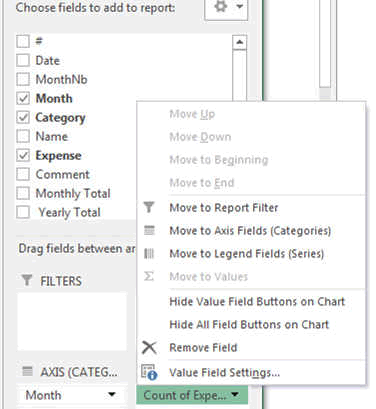 If you add data in you entry table, then the Pivot table will not refresh automatically. To refresh the chart, press ALT-F5.